Seti II’s two small obelisks rise on a terrace facing the Nile. From this point we approach the temple of Amon between a double row of ram-headed sphinxes. These have sun-discs on the head and a statue of the Pharaoh between the forepaws, showing the Sun-god as strong as a lion, as docile as a ram, and protective of the Pharaoh Ramses II who placed them there. We must bear in mind that in approaching the temple from the front we actually reverse, apart from a few exceptions, the order of building. Before us rises the massive first pylon (Plan 4 P.1) which dates from the Kushite Dynasty and which was never completed. It is 113 metres wide, 43 metres high and 5 metres thick. On the doorway leading to the Great Court is an inscription (a) recording the latitude and longitude of the chief temples of the Pharaohs as calculated by the group of scholars accompanying the army of Napoleon to Egypt. The Great Court, which was built during the 22nd Dynasty, covers the massive area of 8,919 square metres" On the right it incorporates a small temple built by Ramses III (page 41) and on the left a small shrine built by Seti II, comprising three chambers dedicated to Amon (in the centre) and to Mut and Khonsu respectively on either side. Towards the centre of the court is the base of what was once a pair of pedestals for statues and behind this is a double colonnade. The five columns to the left are being reconstructed and the single intact column to the right is inscribed by Psemmetikh II of the 26th Dynasty, who placed his name over that of the Kushite Taharka of the 25th Dynasty. It also records the name of Ptolemy IV. On each side of the court is a row of sphinxes. These flanked the doorway when the pylon at the rear of the court (P.2) formed the entrance to the temple in the reign of Ramses II. They were removed and placed near the side walls when the entrance was extended towards the Nile. Against the inner wall of the first pylon, at (b), are remnants of the crude brick ramps by which the stones were heaved into position. The last two columns on this same side of the court (c) provide another interesting clue as to how the ancient Egyptians conducted their work. Because they were never completed they show that the roughly-shaped stones, also heaved into position on ramps, were shaped after erection and that the polishing and decoration were performed from the top downwards as the brick ramps were removed layer by layer. 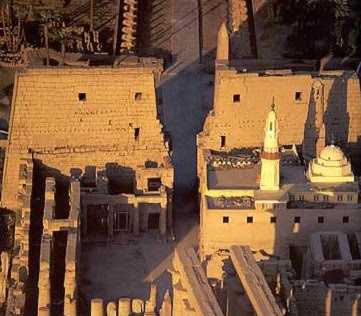 The grey sandstone Shrine of Seti II to the left of the court was dedicated to the Karnak triad; Amon, Mut and Khonsu. The centre section, to Amon, is the best preserved. On the walls are two different representations of the deity. Near the end of the right-hand wall Amon is seated in human form with his characteristic headgear and with Mut and Khonsu seated behind him. On the left-hand wall he is depicted as a ram with the sun-disc on his head and travelling the heavens in his sacred barge. The Holy Triad was a common feature of the gods of ancient Egypt. At Thebes, Amon had Mut and Khonsu. At Abydos, Osiris had his sister-wife Isis and their son Horus. At Memphis, Ptah had his wife Sekhmet and their son Nefertem.